When it comes to technology, or anything else in life, everyone has their own opinion. No two people are completely the same, and what is cool for one person can be simply boring for another. We at PhoneArena are completely aware of that fact and that is why we always try to maintain a well-balanced opinion, representing the views of the general audience as much as possible. With the announcement of the next-generation Nexus devices, Google is eclipsing the competition both from a hardware specs standpoint and pricing – just when things are beginning to heat up. Even better, I’m ecstatic to know that both the Google Nexus 10 and LG Nexus 4 will be arriving in November, just in time for the crucial holiday period. Between them, I have to say I’m a bit more excited about the Google Nexus 10, since it’s seriously packing a beefy specs sheet worthy of turning heads – whereas with the LG Nexus 4, it shares many similarities to the LG Optimus G. Regardless, the killer pricing attached to these two wonderful devices goes to show the tightening grasp that Google has nowadays to become the premier force in the mobile landscape. As usual, Google will unleash the latest release of Android (Jelly Bean 4.2) with the release of the newest Nexus devices – this time the Nexus 4 smartphone and Nexus 10 tablet. The Nexus 4 (made by LG) is one of the hottest smartphones this holiday season, and will give the Samsung Galaxy S III some competition. Not only because its running stock Jelly Bean 4.2, but as it also comes equipped with the newest 1.5GHz quad-core Snapdragon S4 Pro processor and will have 2GB of RAM – which should make the phone lighting fast. Combine that with the 4.7” HD display, and you can see why it is such a hot item. My concern is that they left off 4G LTE for data, and since voice can only use GSM (no CDMA model), that they are drastically limiting who can buy the phone, as Sprint and Verizon customers are left out. Meanwhile, the Nexus 10 tablet (made by Samsung) is butting-heads with the newest iPad from Apple, and a slew of other Android tablets on the market. But what interests me the most about the Nexus 10 is the stunning 10” 2560x1600 HD display, combined with Jelly Bean 4.2, that will make it of the best tablets on the market. I'm planning to trade in my Galaxy Nexus for a Nexus 4 on release day. $349 unlocked is just too good to pass up on that hardware. Of course, I'm on T-Mobile, so the lack of LTE doesn't affect me like it will many users out there. I may want to blame Verizon and its closed CDMA network for the lack of an LTE model, but it's still a failure by Google to not give the option, especially for international users. The Nexus 10 is nice piece of hardware, maybe not be the most attractive, but Google seems to be aiming for power at a lower price with the Nexus devices this year. The big trouble is still the app selection for 10" tablets in the Play Store, which is still lagging behind because of the relatively slow adoption of Android tablets. It's leading to a vicious cycle: fewer apps means fewer buyers means fewer apps... I'd still recommend a Nexus 7 over a Nexus 10 to anyone interested. While Google did the right thing cancelling their New York press conference that was in Sandy’s path, it’s a shame that they didn’t get to surround the product launch with their own “story”; that narrative is important, because this was a true coming out party for Nexus as a consumer brand. The Nexus 10 is the more exciting of the two announcements to me, because it’s a completely new hardware design (and new territory for Nexus devices). With the high resolution screen it appears to be the first Android tablet on par with current iPads. The Nexus 4 looks like a better built Galaxy Nexus, but the lack of LTE suggests it will be targeted more at international markets than the U.S., where LTE has become more necessity than luxury from a marketing point of view. That said, I hope Google sticks to its guns with Nexus phones until it can work out a deal with Verizon and AT&T to get more control of their device, in much the same way Apple did with the iPhone. After thoroughly enjoying the Samsung Galaxy Nexus, the LG Nexus 4 has very big shoes to fill. Will it? Almost. Sprint and Verizon customers will not be able to partake in the latest Nexus hardware without switching carriers (and possibly breaking a contract). Existing AT&T and T-Mobile users will be able to enjoy presumably great hardware and processor performance, but no LTE connectivity. Galaxy Nexus users that stored more than 8GB of stuff will have to rely on the "cloud" which while a perfectly viable option, is not always ideal if the network is congested or if the battery is low. So, despite the hardware specifications, the LG Nexus 4 is an "almost" device. The Nexus 10 on the other hand will not face such barriers. Android tablets, by and large, have been very successful. The key for the Nexus 10 will be its price point, since specification-wise, there is not much that differentiates it from other tablets. It does have the distinction of being a Nexus device though, and that sets it apart in ways that mere specs cannot. Just as Apple was late in joining the sub-10-inch tablet segment, Google is facing much stiffer competition in the 10-inch segment especially against established players like the iPad, and new, but capable entries like the Amazon Kindle HD 8.9 inch. The LG Nexus 4 is the definition of a game-changing device! It is astonishing how great of a smartphone one can get for so little, and we have to thank Google for making that possible. But it is certain that other smartphone makers aren't going to just sit around and will release alternatives sooner than later. That's when it is going to get even more interesting! As for the Google Nexus 10 tablet, it is already at the top spot in my wishlist. The Nexus 4 is all about the price and the ecosystem. Simply put, it’s a gamechanger. We’ve never seen a device with flagship characteristics have nearly half the price of all its competitors. If you didn’t like Google’s ads, you might want to rethink your opinion about them because they are what makes the Nexus 4 possible. 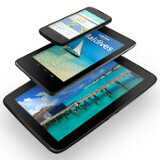 The Nexus 10 is a needed boost to the ecosystem. It’s the tablet with the highest-resolution screen on the market, and that alone is telling. However its main goal is to get developers interested in larger tablets on Android, and at $399 it has the potential to do so. The launch of such powerhouses like the Nexus 4 handset and the Nexus 10 tablet at such low price points is throwing a wrench in the competitors' pricing strategies. Google's aim is to lock users into its Android platform and enlarge mobile search revenue, so the prices go in its favor even with a minimal profit margin. The lack of expandable storage also hints at an intention to lock people in the ecosystem, which is now much bigger on movie rentals and purchases too. The Nexus 4 is the best Android phone for the money, and the Nexus 10 is the best Android tablet for its $399, and the only restraint on the sales of those two will be availability. One should not have any doubts that the LG Nexus 4 and Samsung Nexus 10 are remarkable devices as far as technology goes. Both feature super-fast chipsets and have lovely screens, especially the Nexus 10, which is the first tablet to surpass the iPad in terms of pixel density. Both devices will definitely help Google expand its reach in the mobile sector, thanks to their affordable prices, though I'm not really sure how far the search giant will be able to go this way. We should not forget that the iPhone and iPad did not become so successful due to cutting-edge specs. Those immense profit margins are not the result of having super-specs. This makes me think that Google is playing the same old game as before, just stepping it up a bit. The company's gift and curse — to create products that are mainly appealing for the relatively small group of geeky users — is still following it like a shadow, which is a bit troubling. Personally, I'd like to see Google take Android in a new direction - where design and style will be just as important as functionality and customizeability. I'd like to see Google act a bit more like Microsoft nowadays - guiding its hardware partners into designing better, higher-quality products. Products that will not only "get the job done", but ones that I'd want to hold in my hands, just because it feels good, and ones that I'd just want to stare at for minutes, just because I like what I see. These things are as important as they aren't. True. Google is moving in the direction that Ray described. While Apple stuff may arguably have a better design, thay do not have 'killer specs'. Apple's specs can be easily surpassed by other OEMs. Name one tablet that has surpassed the iPad, and one phone that has surpassed the iPhone 5...take your time. tablet:Galaxy tab 10.1, galaxy tab 7.7, galaxy note 10.1, amazon kindle hd, nexus 7, nexus 10, most other android tablets phones: galaxy s3, note 2 ,note, s2, most other android phones. Ray has always been definitely pro-apple. Ray what game are you talking about? Better specs mean better functionality not to mention android has a kiler ecosystem! Granted apple's eco may be more advanced at this stage but android ecosystems are compatible with Windows which 88.14% of the pc owners use! For example if I have to keep two phones I would go in for an android and windows phones with an android tablet because they can work great with my windows pc as both these ecosystems are compatible with each other! Ray are you telling us that Apple products sold as many as they have because of their fashionable design? Please! Apple customers are not that shallow...everyone looks for a mix of style and functionality and Google is giving just that with the Nexi devices! I think the vast majority of people buying iPhones does not use much of the phone's functionality. Not that there's anything wrong with that, of course, just saying. +1, probably right about using the full features. I'd say a lot of Android users don't use all their features either. What Android device, of any type, features "great design"? I'm guessing you like Kia cars if you think that loads of cheap-feeling plastic evokes "great design." One X, LG Nexus 4, Xperia TL, Droid RAZR HD MAXX to just name a few. And no, I'm more of a Lexus guy. Kia Sonata 2012 has a beautiful design btw. Are you the same Hemlocke on XDA? If that's the case I know for a fact you like and own Android devices. The LG Nexus has great design. I actually traded in my Mercedes GLK for a Sorrento SX. No regrets whatsoever. My Mercedes had just as much plastic. Then again the iPhone 3G/S also was mostly plastic, but no one complained because it was ......(wait for it) magical. People complain about plastic, yet plastic is designed into almost everything from medical equipment, to the most expensive cars. Please show me the latest plastics and how they're ruining our lives. Call me selfish, but i could care less what the majority uses as far as features. I really like where google is going, and I'm not the only one. 68%? Where'd you come up with that number? You really believe that "geeky users" make up 68% of the smartphone market? Do you understand that there's over a billion smartphones being used in the world (http://finance.yahoo.com/news/global-smartphone-u​sage-tops-1-122000484.html)? So there are 680million users of smartphones that you would classify as "geeky users"? As someone once wrote on a tech blog, "Think before you write anything." you have to read and think about 68% of smartphones sold are android so i make fun of rays http://www.phonearena.com/news/IDC-3-out-of-4-smartphones-shipped-with-Android-in-Q3_id36202 68.2%!!!!!!!!!!!! For me, Nexus 10 + Note2 are the best couple ever. Oh Yeah, I'm going to buy both of them. Great phone and tablet, but its the prices that r the real killer. The hardware is where it is at. They are giving others a better choice to spend their hard earn money. The only reason why the prices seem great is because Apple prices are "normal" to the masses. Pay less money, and get less value. Makes sense. The iPhone 5 outclasses the N4 in every way, and aside from resolution, the iPad 4 destroys the N10. so you're saying I should pay more money for less and get ripped off, then brainwashed to say its ok? The truth is that, if the iphone was priced competitively as the midrange phone that it is. no-one would have a problem with it, but Apple are greedy and want to charge ridiculous amounts of money for it. "Midrange"? The SGS3 is priced very close to the iPhone 5, but costs less to build. The iPhone 5 outperforms the Android flagship (by sales volume) in almost every measurable metric, so what does that make EVERY OTHER Android phone? What does that make Samsung? Are you ignorant? How does the iPhone 5 outclass the Nexus 4 in every way? Let's take a look... Hardware: - 1.5 GHz quad core Qualcomm Snapdragon S4 v 1.2 GHz - 2 GB RAM v 1 GB RAM - 2100 mAh battery v 1440 mAh battery - 4.7' display v 4' display - NFC v no NFC - Rear camera is the same (though the Nexus 4 offers more software features) - Front camera: 1.3 MP v 1.2 MP Software: - Android 4.2 v iOS 6. Enough said! The only things iPhone beats it in is pixel density (very sligthly), 4G (but for a lot of people 4G isn't available), and a 32/64 GB storage option. So clearly, the iPhone 5 does NOT outclass the N4 in every way (not even in most ways). And for a superior device (both in hardware and software), you pay half the value. -It doesn't take a powerful CPU to run an app launcher. The difference in speed in the 4S to the iPhone 5 is minimal. Android, on the other hand, when paired with Project Butter and a quad core CPU, makes the phone fly. -Same as above -Battery life on the Nexus should last all day thanks to the S4 Pro -Size is a preference, yes, but reading things from a tiny screen makes me cringe -I'm pretty sure Google is going to release a LTE model like they did with the Galaxy Nexus. Give it time. It took Apple almost two years to join in on the LTE fun. -I rather have camera options and features out of the gate than a simple option for HDR or "Panorama," which took a year. 360 Panorama > 180. -Android 4.2 is a good enough reason to explain why its better than iOS 6. It's so far ahead Apple has been playing catch up since 2010 and has failed to deliver users the true OS experience. Maybe next year in iOS 7 you might be able to change your keyboard. Anything else you want me to explain to you?